In England, the main currency is called the pound. Smaller units are called shillings and pence. A pound is 20 shillings, a shilling is 5 pence, hence a pound is 100 pence. This system has been in place since 1971; before 1971, a shilling was 12 pence. There are many slang equivalents for these: bob for shilling, quid for (paper) pound. There is a term in use that is of a different nature: the guinea. The guinea is not a name for a coin or a bill, but the name for a value. One guinea represents the same as one pound and one shilling, or 21 shillings. A Wikipedia article says that guineas are used by art dealers and lawyers to quote their prices, and British horse races still express their prize funds in guineas. Guineas can also be used if a value is not a whole number of guineas. You can have a fifth of a pound (4 shillings), and you can likewise have a third of a guinea (7 shillings). The convenience of dividing by three is sometimes offered as a reason why the guinea is still around. For somebody raised outside of this culture, like me, it isn’t easy to appreciate the appeal of having both pounds and guineas around (even if the guinea doesn’t exist as a coin or bill). The relationship between pounds and shillings and guineas gives us an interesting background in which to talk about expressing things in terms of different units. The process of stating something in new units is often called transformation, and I’ve suggested earlier that transformations are a frequent source for encountering matrices, and specifically square matrices. Here, the amount is 3 guineas and 5 shillings. This same value could be re-stated in terms of pounds and shillings. This is important: the same amount, but in a different representation. It is not particularly difficult to convert from one representation to the other, in either direction. The conversion is simple enough that any mention of matrix multiplication would sound like absolute overkill. Still, this example is useful to introduce the structure of a transformation matrix, and this will help us when we look at more practical examples where the conversion isn’t quite so trivial. where the original representation is on the top right, the transformation matrix is on the left, and the resulting representation in pound/shilling is on the right. 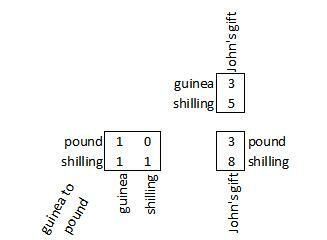 You can check to see that it works, and that it will work for any amounts expressed in guineas and shillings. Yes, matrix multiplication is overkill here, but it does work and it does allow us to illustrate something useful. 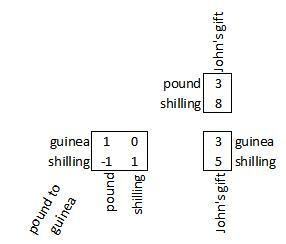 The transformation matrix reflects (in its pound column) that one pound equals one guinea minus one shilling, and reflects (in its shilling column) that one shilling equals zero guineas plus one shilling. You can verify that the matrix multiplication works, and will work for other pound/shilling amounts (as long as you allow negative shilling amounts and continue to ignore the issue of breaking pounds into shillings).